Not so long ago I was in the process of discussing philosophy with a group of students, one of whom was a Russian. Somehow the question of the Russian bombing of Chechnya crept into the discussion, and at once he bristled. “You accept that the Chechens are all al-Qaida?” he demanded. Well, the answer to that must be “No”: anyone with any knowledge of the history of the Caucasus would know that Chechens would have every reason to hate Russians without the need of any imput from al-Qaida. I fear my Russian student knew little of the history. 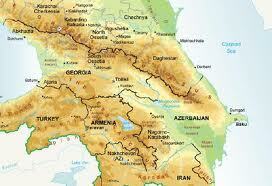 Georgia and Armenia were two ancient independent Christian kingdoms, always under pressure from the Moslem Turks and Iranians. Early in the 19th century both became part of the Russian Empire, along with the Moslem territory of Azerbaijan to the east of them. The last Tsar, Nicholas II, thus boasted, amongst his many other titles, those of “Tsar of Georgia, Lord of the Provinces of Armenia, Sovereign of the Circassian Princes and the Mountain Princes”, all of which refer to the Caucasus and the lands beyond; the last title specifically referring to the Chechens amongst others. The trouble, from the Tsar’s point of view, was that Georgia and Armenia were separated from the rest of his empire by the Caucasus, a vast mountain range inhabited by a confusing patchwork of different peoples: Ossetians, Ingush, Chechens, Avars and many others; some Moslem and some Christian; many of them ferocious warriors and regarded by the Russian government as little better than lawless bandits. (The only British parallel, though on a much smaller scale, would be the Scottish highland clans before 1745). Resistance to the Russians was led by Shamyl, a Moslem chieftain from Daghestan who saw himself as fighting a holy war against the infidel invaders. the war continued for decades and it was only in 1856 that ferocious scorched-earth tactics forced Shamyl to surrender. He was permitted to go to Arabia to die. During these decades of struggle in the early 19th century, the Caucasus was a “wild south” for Russia, much as the Wild West was to Americans soon afterwards. Russian intellectuals were fascinated by mountain warriors, with their strange codes of honour, and by the beautiful, untameable women. Pushkin went there during his exile from St Petersburg. Lermontov used the region as the setting for the first great Russian novel, “A Hero of our Time”. Tolstoy served there in his army days, and used his experiences in two early stories, “The Cossacks” and “The Raid”, which describe the Cossack forces holding the line of the River Terek against the mountain clans. He reverted to the theme at the end of his writing career. One of his last stories was “Hadji Murat”, which is based on an actual historical character: a Chechen chieftain and ally of Shamyl who attempted to defect to the Russians but was trusted by neither side and was eventually killed. The Russians built the Georgian Military Highway through the mountains. They buuilt cities like Vladikavkaz (the name meaning “Hero of the Caucasus”), and, to intimidate the Chechens, Grozny, whose name actually means “fear” or “terror” (The Tsar known in Britain as Ivan the Terrible is, in Russian, Ivan Grozny). Eventually a bandit from the mountains took over the Russian state, in the person of the Georgian Joseph Djugashvili, better known as Stalin (though some maintained he was not a true Georgian, but actually half Ossetian!). One of the surprising achievements of the Soviet government was to cause the continuation of almost all the old Tsarist empire, with its great patchwork of minority races. It is safe to presume that many of the mountain peoples resented Russian rule as much as they do now, but to the Soviets, those who resisted the rule of Moscow were branded “petty-bourgeois nationalists”, an epithet improbably applied retrospectively even to Shamyl. (How a bandit clan chief could ever be described with a straight face as “bourgeois” tells us something about Soviet propaganda). Near the end of the Second World War, Stalin imposed his own solution to the problem, and a very typical one it was too: the Chechens, the Ingush and various other races were accused of having collaborated with the Nazi invaders, rounded up down to the last woman and child (even soldiers serving in the Red Army were included!) and shipped off to the wilds of central Asia or Siberia, where over the next few years about a third of them died. Eventually Khrushchev permitted most of them to return to their homelands: a development which the present Russian government presumably regrets. When Communism collapsed and the USSR was dissolved in 1991, the constituent “republics” overnight became fully independent states, with the frontiers decreed for them by Stalin in his constitution of 1936. Having been part of the Russian empire and then the Soviet Union for almost 200 years, it could hardly be expected that these political frontiers of the new Trans-Caucasian states bore much relation to ethnic ones, and wars have continued there, on and off, ever since. The homeland of the Ossetians ended up being half in Russia and half in Georgia, which led to the recent war there. But most of the North Caucasus was legally part of Russia, whether the people there wanted it or not, and the attempts by the Chechens to gain independence have resulted in two brutal wars and terrorist retaliation. Grozny, built by the Russians, has been destroyed by Russian bombs; an event which the western powers have viewed with remarkable indifference. Just imagine the howls of condemnation that would have come from Washington if it had been a Communist government doing the bombing! Russia did exactly the same thing in Chechnya as, for example, Great Britain and Spain in America, massacring most of its indigenous population. On the other hand, local tribes weren't peaceful cuties -- they scalped people, among other things. The same goes for the Chechens -- I've met (non-Russian) people from the region who described them as a tribe of mostly agressive bloodthirsty mountain savages governed by extremely patriarchal and sexist traditions. It was the Russians who introduced the Chechens to the little culture they have. There's no justification whatsoever for either invasion, nor is there for any kind of terrorism, since it always targets innocent people. But that's the way this world works -- might is right. Chieftains who fight for independence usually have their place at the trough at heart, rather than their subjects' well-being. Understandably, no western power is stupid enough to mess with Russia because of Chechnya (after all, they've got the nuke). I have noticed that in post-Soviet Russian novels, Chechens often appear as gangsters and gunmen. If all Chechens are incorrigible bandits, a rational policy might be to let Chechnya break free and then deport all Chechens from Russian soil. But it seems the Russian government, alone amongst the old European imperialist powers, is determined to hold onto its old multiracial empire, or even try to regain the lost territories. I don’t believe any ethnic or regional groups are bandits by nature (something in their genes, maybe?). But I do believe they may be bandits by culture and upbringing: something I was trying to explain in my poem, “Pagan Philosophy”, and in some old Blog entries on “Early Ideas”. This has always been a strong tendency amongst peoples living in remote poverty-stricken rural areas, especially in mountain territory. Societies there tend to be divided into clans, constantly raiding and feuding, and are extremely difficult for central government to control. Examples might be the Scottish Highlands before 1745, much of the Balkans, Italy south of Naples (especially Sicily) and Corsica. Outsiders regard the actions of such peoples as simply criminal, but the clans do not see it in that light: it is just their way of life, and always had been. With luck, such habits may succumb to the lure of civilization (as was the case with the Scottish clans), but there can always be a reversion, especially in times of disorder and violence. The treatment of the Chechens by Stalin, and more recently by the Russians, would be a case in point. I would also cite the case of Yugoslavia. I read recently Rebecca West’s “Grey Eagle and Black Falcon”, about her tour of Yugoslavia in the 1930s: where what emerged very strongly was the intense hatred between Croats and Serbs, Bosnians and Montenegrans, with violence lurking close to the surface. This was exacerbated during the war, when the Nazis encouraged the Croats to murder Serbs and Jews, and Himmler even recruited an SS brigade of Bosnian Moslems for the same purpose. For 40 years afterwards, Tito kept a lid on things, but once his iron hand was removed, the old hatreds resurfaced in new orgies of killing. (The west, of course, encouraged independence for the different racial groups in Yugoslavia, but not for those in the North Caucasus). To return to my original point; I do not think the Chechens need any input from Al-Qaida to make them hate Russia. The accusation, “Your people murdered my father”, when delivered not against foreigners, but against fellow-citizens of the same state, is a potent enough cause for violent outrages in any society; and fortunately one that we in the west are generally spared. Every nation has its idiosyncrasies and inclinations (the same goes for persons), however that doesn't mean that all Chechens are criminals, all Irish people are terrorists, or all Georgians look like Stalin ;-). They say it's all in our genes, and therefore cultures are mainly conditioned by different genetic makeups, that could be in turn moulded by the environment, at least to some extent. Probably, Russia still holds onto Caucasus because of oil and gas pipelines, and the danger of the growing Islamic influence in the region. Remote mountain tribes (there's quite a bunch of them in Caucasus, less known in the west, and very similar in their ways and customs to the Chechens, but please don't put southern Italy on the same list -- the cultures are simply incomparable) are indeed more prone to poverty-triggered feuds, while here in the west wars are usually fuelled by greed, which empires with enough power temporarily solved through invasions of foreign countries. Any criminal considers their activities a way of life, Irish or Basque nationalists believe they fight for freedom (or make believe they do), England, Spain and the rest of the world see them as terrorists. I did intend to travel through the Caucasus on my 1984 trip. The itinery was supposed to involve a drive south through the mountains along the Georgian Military Highway, but we were taken by air instead: naturally, no reasons were given for the change. Of course it wouldn't be possible to travel there now. I fully accept that there are different cultures in different countries. What I was trying to point out was that there are certain common features to be found prevailing in remote mountain areas. These include weak control by central government, a clan-based social structure, and a way of life involving (from the point of view of an outsider) lawlessness and banditry. There is a strong overlap between this and resistance to the central government. You will find this covered by many writers. For the Scottish Highlands before 1745 see John Prebble, "Glencoe" and "Culloden", for the difficulties faced by the Italian government in establishing control over the south see, as an introduction, Christopher Duggan, "The Force of Destiny", for the Balkans see Rebecca West, "Black Lamb and Grey Falcon" (I apologise for remembering the title wrongly on my earier entry!). I would also recommend a novel, Nikos Kazantzakis, "Freedom and Death", about 19th century Crete, which illustates very well the overlap between banditry and resistance to an occupying power (when you think about it, bandits and other violent criminals are always likely to be more effective resistance fighters than ordinary civilians!). Above all, I would recommend Eric Hobsbaum, "Bandits", a brilliant little historical survey. I actually lived in different cultures, visited some mountain communities and even personally met some bandits (not as a simple tourist). Many outlaws seek to disguise their activities as a fight against the oppression, which gains them followers in nationalist environments. Besides, such banditry, denominated as terrorism, has a higher status and gets more lenient treatment from the state and international community, providing the latter with better political leverage, when it claims to be battling for some political or patriotic cause. In my experience, the official picture of these regions differs significantly from the truth. There's always a gap between what local people tell foreign tourists to their face and what they say once they turn away. History books are a kind of fiction too, let alone novels, since there are lots of things no writer would dare publish. Instead we are offered sweetened pills. I tend to believe only what agrees with my own common sense. All societies have common features to certain extent, but to my eye, that doesn't make them comparable. One way or another we all are ruled by clans, just look at the politicians, diplomats etc -- they all come from the same circles, not to mention royal families and aristocracy in general. Governments usually manage to establish control when they really want to, (Brigate Rosse in Italy, for example), whoever goes against the state, loses. Mafia in the south of Italy has never been controlled because it has long since permeates the north and is inside the government itself (that's what most insiders say). Just like it has never been eradicated in the US, Colombia, Al Qaeda is still at large or so they say, and the list goes on. In the ‘Lord of War’ Nicolas Cage explained some of the reasons why mafia, bandits or terrorists are allowed to exist pretty well. Even revolutions simply reshuffle the countries without changing the core -- e.g. there has never been true democracy in Russia, despite all revolutions, coups or rebellions. One tsar just replaces another. The form may eventually become milder, but essentially, it's more of the same. For the deportation of the Chechens and other racial minorities, see Robert Conquest: "The Nation Killers", and Simon Sebag Montefiore: "Stalin: The Court of the Red Tsar". Of course, if one doesn't trust any historians to tell the truth, there is no point in reading anything, and it is questionable whether we can have any accurate information about the past, or indeed about anything else. What certain people effectively tend to say however,is, "I know the truth, and all the professional historians/economists/scientists are idiots/liars/in a conspiracy together". Ultimately our only guarantee against academic dishonesty is a free press and the free exchange of ideas. Then, if Professor Smith is indeed spouting a load of dishonest drivel, his rival Professor Brown will take great pleasure in bringing it to the attention of the public!